← “Spin Path Integral” paper proofs sent off. 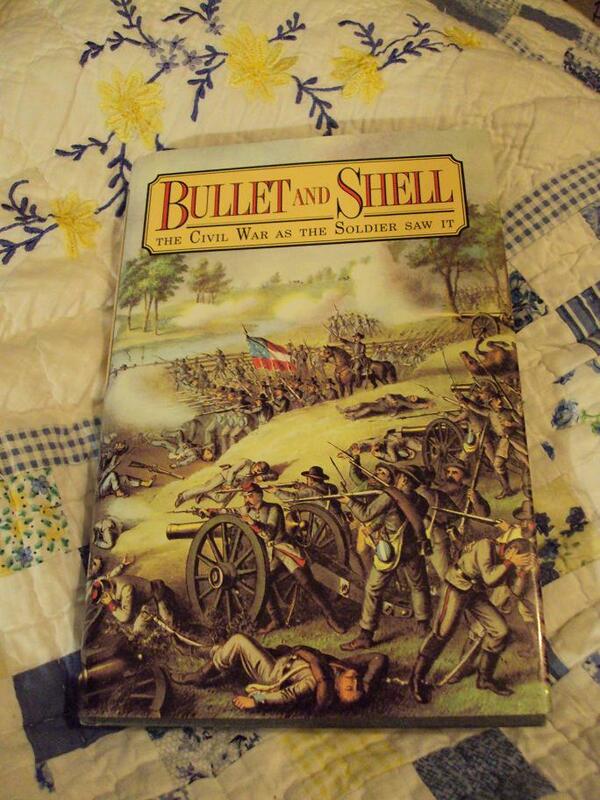 Bullet and Shell, the Civil War as the Soldier saw it is an inexpensive book at Amazon and a good read. The mild fighting as the Arab regions shake off old dictators gives me a reason to write a book review for it: it’s a lesson on why civil war should be avoided. The book was written in 1884 by George F. Williams, an author with a very common name and possibly several other books. The book is a fictionalized memoir of the U.S. Civil War, 1861-1865, and follows the experiences of a young college graduate who enlists in the union side. Since I’m writing this post with friends in mind from far away, I should explain some things. As I write this, the president of the US is Barrack Obama. He’s a member of the Democrat party. The previous president, George W. Bush, is a member of the Republican party. You may have noticed that the election of 2008 which replaced a Republican president with a Democrat president was widely reported, but didn’t result in any major changes in foreign policy. The reason for this stability (which for a world power is definitely a good thing, you don’t want to see the US alternating between Communist and Fascist governments) is that the US system of elections forces the political parties to compete over the center part of the population. The change of power in the US in 2008 was peaceful, but that’s not how it always has been here. The election of 1860 split the nation into two sides with various names. The “U.S.A”, “North”, “Union”, or “United States of America” under Abraham Lincoln was Republican, while “South”, “Confederacy”, “CSA” or Confederate States of America was Democratic. The South included the slave states and slavery was probably the major issue of the war. The war lasted 4 years and killed 620,000 people. Whether in terms of human life or destruction of property, it was the most expensive war the US has ever been involved in. The Civil war ended only after the larger and more industrialized North had produced enough munitions to kill or severely wound about half the adult males in the South. At that time the surviving Southerners agreed to rejoin the US. Williams’ book was written in 1884, about 20 years after the Civil War. By that time, the two sides were on the road to reconciliation. Williams’ book was probably intended to help. It remains a reminder of the horrors of war. As with my other book reports, I’ll type in a few paragraphs to give a flavor of the book. Late in the afternoon of the first day of July we [Republican soldiers] reached the picturesque town of Hanover. [Pennsylvania, a Republican stronghold] Near the cross-roads were lying the bloated carcasses of half a dozen cavalry horses, evidently slain in a brief skirmish between Pleasonton’s [a Republican general] and Stuart’s [a Democrat general] troops, a few hours before our arrival. Close to the road, near the scene of the cavalry fight, stood a farmhouse, at the gate of which was an old-fashioned pump and horse-trough. The pump-handle was in constant motion, as the weary, foot-sore soldiers flocked around it to quench their thirst with the delicious water that flowed into the mossy trough. Coming up and waiting for my turn to drink, I noticed a sunburnt, gray-haired man, leaning over his rude [primitive] gate, watching the troops. He was dressed in a faded, well-worn suit of homespun [home made cloth], having no doubt spent the day in the hayfield; and I could see that he was pleased that his pump was doing such good service. “I ‘spose [suppose] it ’tis [it is], though I never did any marching,” was his brief response. As the old farmer uttered the words he moved a little; and my eye was attracted by a new-made grave among a clump of rose-bushes, just inside the fence. Wondering at the sight, I ventured to ask the reason for its being there. “Whose grave is that?” said I, pointing to the mound of fresh earth. Thanks Nige, the reason trench warfare couldn’t save the South was because the lines were way too long to adequately defend with the available manpower. Being from Texas and all, I’ve felt that the decisive campaigns were the ones that took control over the Mississippi. You have an interesting book; every now and then I run into people who have an exaggerated opinion of the effectiveness of certain weapons, particularly gas. On WW2, an indispensable book is “Wages of Destruction, the making and breaking of the Nazi economy” I agree with a reviewer; almost every page has an an important and true thing to tell even those who’ve read a hundred books on the war. P.S. I wonder why the spam filter caught your comment? Thank you very much Carl. I will read “Wages of Destruction”, which sounds interesting. I thought my comment was deleted when it simply disappeared after pressing “post comment”! I agree that the lines were too long for the South to defend adequately, although they still managed to hang on nearly long enough to see political anti-war problems emerging for Abraham Lincoln. Many wars seem to involve wanton exaggerations of weapons effects on the part of the aggressors, or underestimates of the effectiveness of simple cheap countermeasures. The German General Staff lost both of its world wars for essentially the same reasons, exaggerating offensive capabilities, underestimating defense countermeasures of its enemies, and hence underestimating the time the wars would drag on for, and the problem of the munitions production by its enemies during that long period of time. There is a rumor spread by teachers in military colleges here in England that the German General Staff made this error before WWI because it was ignorant of the facts of trench warfare in the American Civil War. This was partly due to wishful thinking by the arms industry. It seems that the first time a new weapon is used (machine guns, aerial bombing, etc. ), it works very effectively because people are taken by surprise and react like rabbits in car headlights, or sitting ducks. Then this example is used for all future casualty predictions. Early WWI air raids on London (before “duck and cover” advice was introduced by the Government in July 1917 to avoid flying glass and blast translation casualties) killed sixty times as many as died per ton of bombs dropped on London during WWII. If this had been known in say 1935, Hitler could have been stopped without the public’s fear of London being wiped out in a single large Luftwaffe air raid. You’re back! Have really missed your most educational blog. Hope you’ll be telling us what physics mischief you’ve been up to! Well, this is technically true, but Abe would be kicked out of the Republican party nowadays. Teddy Roosevelt too…kind of ironic, come to think of it. Do you have an updated link to your E8 java applet ? The link I have does not seem to work. Hi Carl, I see on your stack exchange profile you are a PhD candidate at Washington State and a member or the LIGO Scientific Collaboration. If you don’t mind me asking, what is your thesis topic and who is your advisor there?